Are you searching for the best canopy? Whether you are enjoying your evening time in the park or planning for camping in the winter season, a canopy can give you the shelter right away. Since it’s a matter of shelter and protection from rainwater or heavy rain, your canopy must be of advanced quality. You need the best canopy for wind and rain so that you can stay safe. We understand the fact that it’s not easy to find the best quality canopy when there are thousands of diverse types and quality canopies available out there. You need to spend hours to have complete knowledge about the canopy. But, we know how precious the time is for you. Therefore, we have done all the hard work and picked the best selling canopies that can support you from wind and rain. Here, we will be talking about five top-rated canopies that are highly recommended by the users and experts. Additionally, for your better understanding and make the right decision, we will discuss some of the important information and essential features. What is a canopy and why do you need it? What are the types of canopies? How to clean a canopy? What are the must-have features to find the best canopy for wind and rain? Since you have already searched for canopies, you may already know that the canopy and a tent are different. But, if you are still not clear about it, here is the chance to clear your confusion. Even though both the tent and a canopy is used for shelter and protection, they are created for different purposes. Also, there is a difference in the design and construction of both products. If you have noticed, the tent is designed to sit and sleep. You can organize a tent with your bedroom comfort. Thus, it’s made of fabric, poles and designed with door and windows. On the other hand, a canopy is also designed with fabric and frame, but it’s open on the sides. You may spend your day under a canopy to get protection from sun, rain or heavy wind. But, it will not provide you with the required shelter as you expect inside a tent. Rather, it will protect your tent, kitchen, camping equipment if you can place all of them under the canopy. More importantly, even if your tent is not waterproof or not suitable for extreme weather condition, a canopy might give you the support during that time. It’s also an easily portable protecting shield you can carry in your back. However, some canopies are designed in a way to use as a tent. So, the basic difference is, you may use a canopy as a tent but you cannot use a tent as a canopy. A canopy can be used in many places. It’s not possible to explain what it is in a few sentences. However, we will try to illustrate what a canopy is. When you are in a forest or wild area, there is a risk of falling tree branches, animal and insects. Thus, to protect your picnic arrangement, tent, kitchen or accessories, you can set up around 100 ft high over the required place. Basically, it’s a protecting roof around the whole campsite or picnic spot. So, from the above discussion, you can realize a canopy is basically a layer used for protection. You may wonder why do you need a canopy when you can find a natural canopy out there. Well, you may not always find such place everywhere. Imagine, you are at a beachside or open space or you may not find a place with a readily made canopy. What would you do? If you have a canopy, you can select any place you like. Moreover, if you choose a tree canopy, there is also a risk of having insects, birds or animals like snake, monkey etc. they can disturb you during sleep or when it rains, your tent and other accessories may get wet. But, if you have a canopy, it will keep you dry and protected from these issues. So, whether there is heavy wind or rain, you will certainly have a hassle-free camping or outdoor event with a canopy. 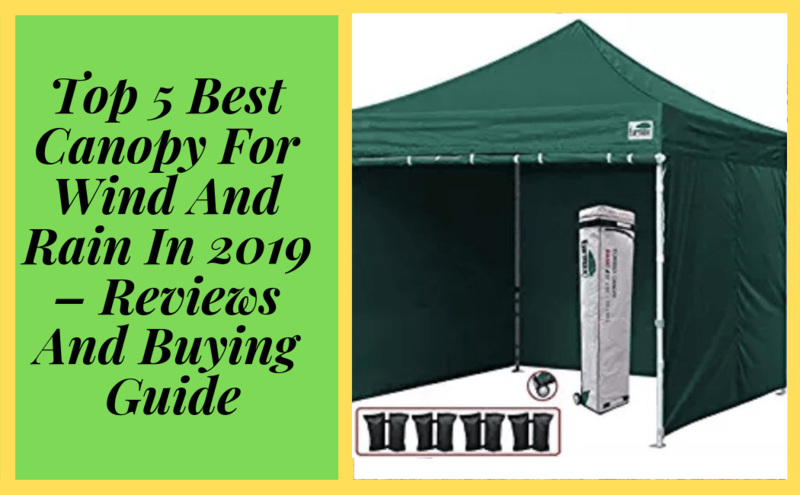 Let’s get started with the reviews of the best canopy for camping in the rain and wind. Now, we are going to present to you the top 5 canopies that are popular in the market. But, we haven’t picked them due to their popularity only. We have also chosen them because they are strong and durable to support you during extreme weather. Not only the users but also the experts have expressed their willingness to purchase these canopies again. So, you can have complete trust in the products and we will try our best to showcase the strengths and weakness of them from a neutral perspective. Let’s get started with our first canopy! Are you searching for a pop-up canopy? Here we present to you our first and best canopy in the list from ABC canopy. It’s a canopy that will become your instant shelter whenever and wherever you need. It’s large enough to cover your outdoor events. Let’s evaluate it’s built quality and strength to combat wind and rain. One of the most important factors of this canopy is the weather resistant quality. Whether you want protection from the sun, rain or wind, the silver-coated PU fabric is strong and protective to support you at worse weather condition. Also, it’s wide enough to cover 10 people at the events. So, no matter you are in campsite or picnic, a good number of people can take shelter under one roof. Are you wondering about carrying hassle? Don’t worry, because the canopy comes with a wheeled bag. You don’t need to hurt your shoulder. All you need to do is pack the canopy in the bag and drag all the way. It’s also easy to set up and can be used in multiple events. 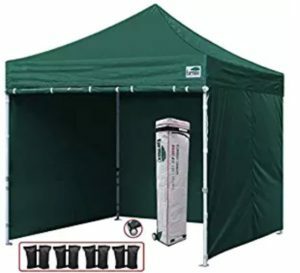 So, if you are looking for a canopy for multi-purpose use, you can purchase this Pop-up Canopy Tent without any doubt. This video for you. Folding off the canopy seems a bit difficult due to size. Are you looking for a canopy at a cheap price? Here is a budget-friendly canopy from Quick Shade with good quality. 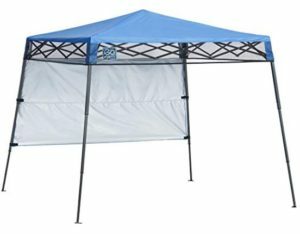 If you are in a limited budget and looking for a small canopy, you can check out this leg canopy tent. It also comes with some noticeable features. Overall, the size of the canopy is not to small and not too big which makes it a convenient canopy. You can use the canopy for any small events and carry easily to the event. Just because the price is low does not mean the brand compromises in quality. Instead, this tent also has a strong build quality and stay steady when used. Also, the frame is made of anti-corrosion material so it will remain rust free in long use. Moreover, it’s very lightweight and easy to set up. Another useful feature of the canopy is on one side it comes with a half wall. It will ensure ventilation inside the tent while protecting you from UV rays and rainwater. So, if you want a canopy in cheap price, here is the Quick Shade canopy that comes with the necessary features you need for small events. Do you want to see another option for an instant tent? You can compare the ABC Canopy with the Eurmax pop-up canopy and choose the one you like the most. It also comes with similar features and quality that you need for camping, hiking or any big events. Unlike the ABC canopy, this tent comes with four walls. Even though the weight is a bit increased due to this feature, still it is beneficial for you during bad weather. For instance, you suddenly face a storm or snowfall and need a place to protect all your necessary things from getting wet. Then you can simply place all the things under the canopy and the walls will give you the shield. Are you worried about summertime camping? Don’t worry. You can remove the walls when you need some air to pass by. I think this canopy gives more freedom and opportunity to stay close to nature and get protection when needed. Apart from the side walls, the canopy is made of durable material. Also, the seams are sealed and weather resistance is ensured. Moreover, the frame is also strong and coated with hammertone powder to save from corrosion and rust. Overall, it’s one of the best pop up canopy in the market due to its strong build quality and user-friendliness. If you want the most outstanding quality canopy, you can definitely go for the Eurmax instant canopy without giving it a second thought. Even though the size of the canopy is big, it’s not difficult to set. The set comes with an instruction manual following which you can set the canopy within a few minutes. Besides, the material used in the canopy is strong to stay steady in wind or rain. It means the fabric is also resistant to any weather condition because it’s made of UV guard material. Are you worried about its portability? Don’t worry. The canopy might be big in size but it’s very lightweight. You can easily carry it anywhere. 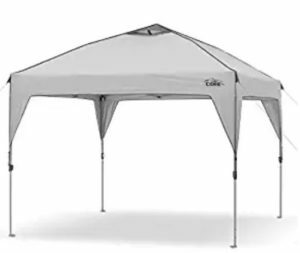 Since it’s a Coleman product, they make sure their product is a durable one and it’s the same for this canopy tent. So, if you are looking for the best canopy from a brand best, here is the opportunity to grab it. Purchase this instant set up tent from Coleman before the stock runs out. Last but not least, our 5th best pop up canopy is from Core. just like all other amazing canopies, this pop-up canopy features also include easy setup, weather resistance, and lightweight quality. Additionally, there are some extraordinary features that make this canopy stand out from others. One of the noticeable features of this canopy is the perfect square shape. To be honest, it’s a difficult and time-consuming job to set a canopy in a square shape. But, with this Core instant shelter, you can easily get it without hesitation. Another important aspect of the tent is the 50+ UV ray resistance. No matter you need a canopy to protect you in summer or winter, this canopy is suitable for all season. Are you worried about ventilation? Not to worry at all. The tent is designed to make sure proper air flow. Due to this, your tent atmosphere will remain cool and comfortable. Besides, to help you carry and set up such huge canopy, the package includes all the necessary accessory and a wheeled carrying bag. Now, you won’t have any complaint regarding portability. Overall, it’s a good quality canopy tent for small to big events like birthdays, parties, get together, picnic and so on. You can have it to use all the year round. So, for any outdoor events, you can use a canopy. Starting from the exhibition, fair, wedding, to picnic, camping or hiking, you can use a canopy any purpose you need. But, if you look up the internet, you will find a lot of different types of canopies in terms of design and functionality. Randomly picking one canopy may not be suitable for you. Therefore, before you purchase, here are the most commonly used canopy types we will discuss to help you take the right choice. The pole canopy tents are widely used and the most popular ones. When you mention about the canopy, automatically people understand it’s a pole canopy or pole tent. Usually, they are used for outdoor events. Such tents are designed with myriad size, width, and high peak. So, if you are looking for a canopy to get together, wedding, picnic or any big events. The pole tents are designed with center poles and side poles. They can give you the right support and especially for heavy wind. You can set the poles deep into the ground easily. And, on the top of the canopy, there is a water resistant fabric for the rainwater to slide down. 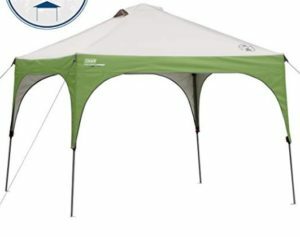 So, overall, the pole tent will give you the support for many outdoor events. If you are searching for a canopy to use in the forest area or garden, a cross-cable frame canopy would be an ideal choice for you. You can easily set up the tent on the concrete ground, pavement or green field. As per the design, the frame of the canopy is with aluminum material which makes it strong and durable. Apart from the center poles, it comes with a frame on the side walls. Then, the frame also holds the fabric strongly to stay steady during wind. Such tents are considered perfect for weddings, birthdays, engagements parties and so on. As from the name, you can understand the instant pop up canopy is easy to set up and less time-consuming. It’s designed with a collapsible frame so that you can easily open like an umbrella. They are extremely lightweight for you to easily carry. So, if you are looking for a small event or short-term use canopy, you can have this instant pop up canopy tent. They are mostly used in the picnic, beach area, bbq parties and so on. However, they are not recommended for extreme weather condition or long-term use. Another cost-effective and one-day use canopy tent is dome tents. They are also easy to set up and remove. Due to the shape and ease of use, the dome tents are mostly used for activities and games. However, it’s highly discouraged to use such canopies for cooking purposes. The custom tent canopies belong to the advanced quality canopies. You can use the tent as you want to depend on the outdoor event. The most amazing quality of the tent is you can give it the design you prefer. Moreover, they are also easily portable and available in different sizes. To use a product for a long time, you need to make sure it’s clean and polished. Likewise, you need to ensure your canopy is clean and tidy so that it stays as new until next use. But, you need to pay attention to how you clean and what you use to clean. No matter what type of canopy you use, you can follow the instruction to clean. Step (1) – fold the canopy properly. (2) – find an open space and place the canopy on the ground. (3) – check if you can remove the fabric. If possible, remove it and leave it open. (4) – take a dry brush or cleaning cloth and clean the dust from the canopy. (6): let the canopy fabric completely dry and restore it to the frame. (7): store it in a safe place where there is no risk of getting wet or stain. There are thousands of good quality canopies available from different brands. From them, how do you find the best one? There must be some identifying feature that makes the canopy stand out, right? That is why we have decided to share some significant features that will help you find the ideal canopy for outdoor events. We have also checked these features in our 5 best canopies for wind and rain. Undoubtedly, you can pick anyone from them or use the features to evaluate the quality of your targeted canopy. Since you are using a canopy for protection, checking the water resistance quality is the first and foremost thing you need to check. If not, then your canopy may tear or become drenched during heavy rain. Usually, most canopies are made of waterproof material. However, don’t forget to check it before purchase. To ensure your canopy is a durable one, you need to check the build quality. So, to check how strong and durable the canopy is, you must check the stitching, material, frame, flexibility and so on. If the frame is stiff, it may be difficult to open and often break. Also, don’t forget to check the stands. If they are not easily stackable to the ground and strong, it will not support during extreme weather. So, carefully check the build quality of the canopy. Some tents are designed with side walls and some are not. if the walls are closed, then you may not have proper ventilation and air flow. So, make sure the fabric used in the canopy can ensure air flow. Or, when you are using the canopy, make sure the canopy is cool and the air is passing through properly. The strength to stand still of a canopy depends on the frame quality. Most of the canopies are made of a metal frame. But, if you are using for a long time, there is a chance of getting chipping, stains, corrosion etc. if the frame is rustic, it will be risky to use. Therefore, check whether the canopy frame is made of heavy duty material and coated to prevent rust. The durability and weather resistance of the canopy also depends on the fabric. If the fabric is not durable, it will not have the capacity to withstand wind and rain. Also, don’t forget to check if the fabric soaks rainwater. If not, the fabric will get wet and tear any time. Moreover, make sure the fabric is properly attached and seams are sealed. Otherwise, you will find leakage when used in heavy rain and strong wind. Overall, the durability of a canopy depends on build quality, the material used, stitching and construction. If they are not attached strongly, the individual elements are of no use. 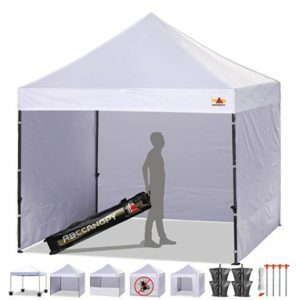 Usually, the higher the price, the durable the canopy is. Still, you should always check if the seams are properly sealed, fabrics are stitched strongly with velcro straps. If these factors are maintained, then the canopy will surely be a suitable one. User-Friendliness depends on several factors. Usually, the smaller size and lightweight canopies are preferred because they are easy to set up. So, if you are looking for a canopy for occasional use and small events, you can choose the small ones. They are easy to open like an umbrella. But, if you are looking for a strong canopy to combat wind and rain, it’s recommended to find sturdy ones. Even if it takes more than one person to set up. Since you are looking for the best canopy for wind and rain, we highly recommend you to look for the above features in your targeted canopy. As mentioned earlier, there are thousands of canopies out there available at different prices. There is a wide variety of quality as well. You may find many canopies in your budget, but it’s hard to tell the performance and quality looking at the specifications. For instance, most users prefer to avoid the canopies that are a bit heavy. Here, if you want your canopy to provide the protection, it must be made strong. Thus, it becomes heavy compared to the pop-up and dome tents. So, there is a risk of taking the wrong decision and face trouble at the event. Also, if you avoid the features and find any top branded canopy, it might ruin your big events like camping, wedding, fair, engagement etc. because it may not be made of water-resistant fabric. So, each and every feature are important to consider to make the right investment in your money. Otherwise, your canopy may turn out useless. For the best canopy for wind and rain, You may also watch the video. We hope you have got your desired canopy for wind and rain. We have tried our best to illustrate all the important details and evaluate the qualities honestly. Reading our reviews, you will be able to understand the strengths and shortcomings of each product. You can trust our statements because we don’t allow any false information. But, before you purchase, make sure you have figured out what type of canopy you need and check whether the must-have features are present in your chosen canopy. Hope you have a safe and comfortable event with the best canopy!